Ronald Reagan Library aerial stock photo of the Reagan Library site in Simi Valley, California. This Aerial photography Los Angeles view captures the library complex and display gallery housing Air Force One. NOTE: We have additional aerial views of the Reagan Library. Please contact us to see samples. 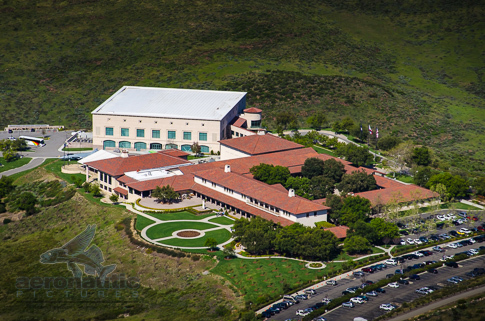 The Ronald Reagan Presidential Library and Center for Public Affairs is the presidential library and final resting place (burial site) of Ronald Wilson Reagan, the 40th President of the United States (1981–1989). Designed by Hugh Stubbins and Associates, the library is located in Simi Valley, California, about 40 miles (64 km) northwest of Downtown Los Angeles and 15 miles (24 km) west of Chatsworth. The Reagan Library is the largest of the 13 federally operated presidential libraries. The street address, 40 Presidential Drive, is numbered in honor of Reagan’s place as the 40th President. Nancy Reagan, former first lady and wife of Ronald Reagan, will also be buried at the Ronald Reagan Presidential Library. Also visible the left side of the background is a Grumman F-14 Tomcat fighter jet.